Nido de Amor is a spacious beach front villa with central air conditioning, pool and rooftop deck. 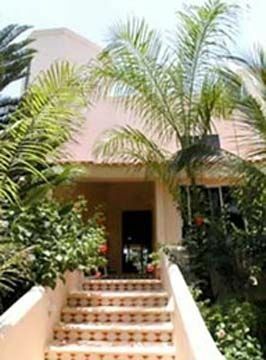 The villa features a beautiful garden entry area with patio on the front side and furnished second story balcony and first story terrace on the ocean side. The high quality of materials and workmanship of this villa translate into tropical elegance and creature comforts. LOCATION: Nido de Amor sets in the gated community of Akumal Sur on the beach of a tranquil Caribbean bay 60 miles south of Cancun in the Yucatan Peninsula of Mexico. This is a beautiful tropical area with turquoise ocean water, swaying palms and white sand beaches. Akumal is noted for extraordinary lagoon snorkeling and spectacular reef and cave scuba diving. INSIDE AND OUTSIDE THE HOUSE: All major rooms in Nido de Amor have terrific views of Akumal bay and the Caribbean. This spacious villa has three bedrooms, 3.5 bathrooms and sleeps up to ten people. The master bedroom is on the second floor with a king size bed and beautiful view of the Caribbean. Another bedroom on the second floor has a queen size bed and a beautiful ocean view. Both bedrooms access a large wrap-around furnished balcony. The third bedroom containing a king size bed is on the first floor with a slider to the pool and beach area. Each bedroom has its own private bathroom. There are also two kitchens, 2 living rooms and 2 dining rooms; one on each level of the house. The living room on each floor has a large futon couch that can sleep up to two people each. THE POOL AND BEACH: An exquisite ocean side swimming pool has a giant tiled turtle inlay and a 9 feet deep end with diving board. The shallow end has a swim-up pool bar with in-the-water tiled seats adjacent to a furnished sun/shade pool deck just off the villa’s living room. Around the corner a bricked and tiled grilling area perfectly situated for pool side cookouts. The pool area is a wonderful playground for lounging around and enjoying this Caribbean paradise. And for beachcombers, the white cool-sand beach of south Akumal is directly in front for strolling, snorkeling and water sports. All bedrooms, living and dining rooms have ocean views! Great place for a relaxing vacation! We loved Nido de Amor! The property and location are both wonderful We have been to Akumal many times, but this time we brought our kids and grandkids and wanted a place where we would feel safe letting the little people swim and play in the beautiful Caribbean. The grandkids (ages 6-9) loved playing in the pool, kayaking, and snorkeling right behind the house. Guille and the staff were so welcoming and made us feel right at home. Chayo and Felix cooked two meals that were superb! The guacamole and pico de gallo were some of the best we had on this trip! We would definitely stay at Nido de Amor again! This is a beautiful, clean, and family friendly home. Thank you, Verna and Guille! This spacious 3 bed, 3 1/2 bath was perfect for our family. The pool, access to beach, kayaks, made this week a paradise for us. My husband and i have four grown children and two grandchildren. We rented the villa and also the cassita which provided plenty of room for everyone to have their own space. We visited the ruins at Tulume, the Akumal Monkey Sanctuary, several cenotes, and spent an afternoon in Playa De Carmen shopping. In the evenings, we enjoyed playing family games in the main area of the home. It was a treat to have two meals arranged for us. The meals were inexpensive, $75 for a family of ten, and delicious. I would return to this VRBO anytime we're back in the area. Fabulous property, wonderful staff, perfectly located, best pool in the neighborhood! My friends and our children just spent Spring Break at Nido de Amor. We could not have asked for a better experience. First of all, the house was perfect--plenty of space. We were 6 adults and 3 children ages 6 - 9. We used the upstairs living room area as a bedroom for the kids, and it worked out perfectly. The pool was the best pool I have ever had at a vacation home and by far the best of any of the other homes we peaked at along the beach. It is large and has a deep end and diving board. The beach is a good snorkeling beach, especially with small kids because it is shallow for a long way out and very calm. We saw fish and coral and sea anemones...and a stingray, which was a little too scary for me. The house is perfectly located for visiting the many cenotes, visting the beach at Tulum which was an excellent swimming beach with lots of great shops and restaurants, and for seeing the ruins of Tulum and Coba. Working with Verna the owner and Guille the manager was easy and they were both so nice. The staff at the house are wonderful and took total care of us. We didn't wash a single dish or make a bed! We had some meals prepared for us, and they were inexpensive, delicious, and provided leftovers for breakfasts and lunches on other days. It was a total luxury for us to not have to prepare meals and wash dishes like we usually do in vacation rentals. We are already planning a return trip. 6 days was not enough--next time we need 10 at least! We will definitely stay at Nido de Amor again! The staff are so kind and meet every need. We did bring our own snorkeling equipment and practiced in the very private pool. This is the best! We felt secure with guarded entrance. We like to cook and use the outdoor open grill ---Thank you for a very best respite. Driving in Mexico just takes practice so go slow. Oscar and Lola's is a delicious restaurant just a few miles down the road. The local grocery in Akumal (on the ocean) has quite a bit of things to but otherwise Chaudrai's in Tulum or Playa have what we needed to cook our meals. The Akumal on the ocean town has a lot of folks wanting to stop tourists---but getting beyond them brings one to the bakery and a few restaurants. Guilla our manager is the best! We feel bad we just used a bit of the space for the 2 of us. Contact owner regarding taxes and any potential length of stay adjustments to rates.